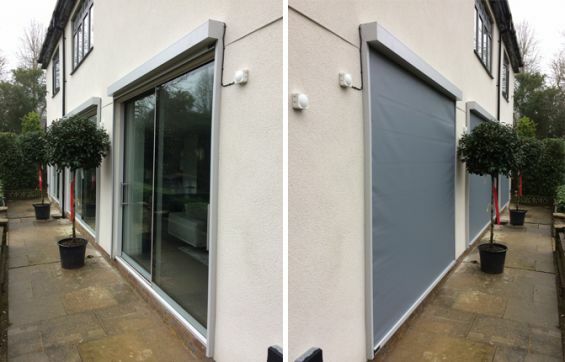 When looking for external shading, after doing an online search you will be presented with a whole host of companies claiming to be specialists and after obtaining pricing you will be presented with a differing price scale, so how do you select? The start to another week and another great review about our professional approach, this time from a client, literally down the road from our factory in Sudbury, Suffolk. 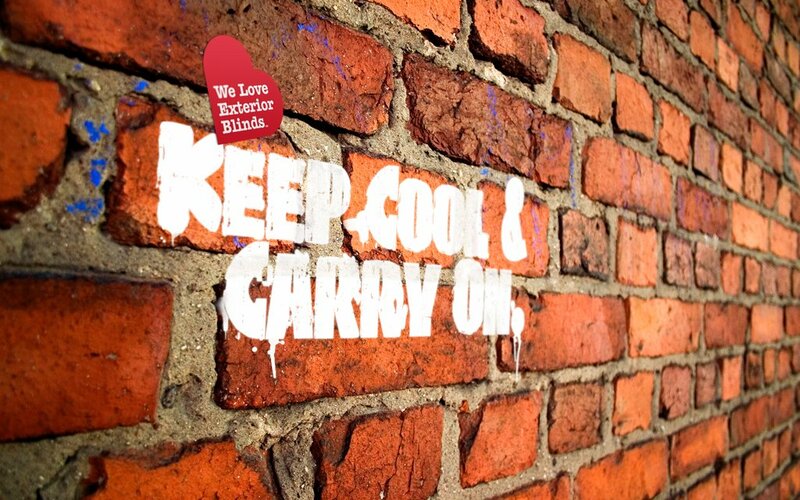 Since the companies inception over 30 years ago, Caribbean Blinds has been dedicated purely to the field of external shading, so it’s fair to say we are truly experts in the field. 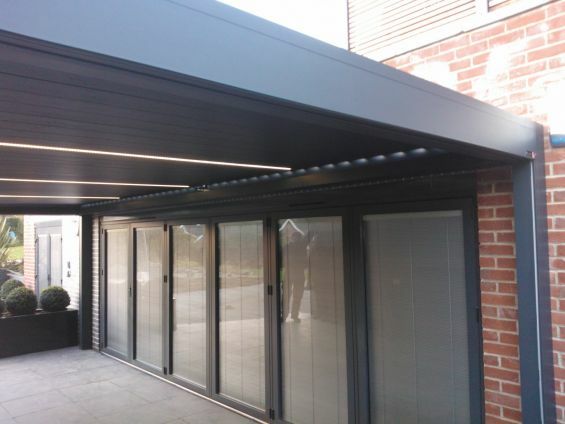 Many clients who contact us for external shading have been told by local companies that it is not possible to install external blinds in their application, particular when it comes to glass roofs, however, with experience comes knowledge and ultimately an ability to do projects that others simply cannot. 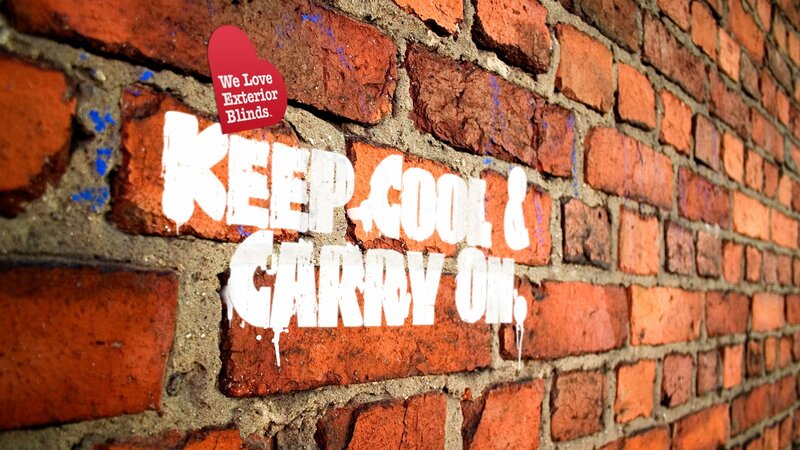 At Caribbean we’re proud of our team who provide exceptional levels of service day in, day out, from the office, to production, to installation and aftercare, everyone plays a key role in delivering the finest external shading systems. 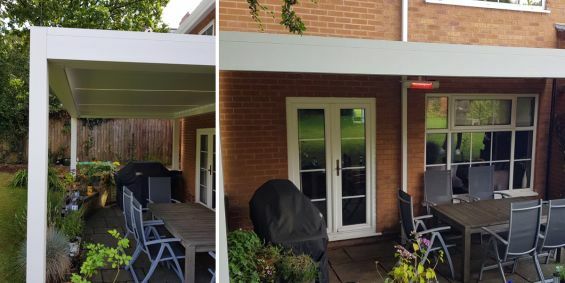 By being dedicated to the field of external shading our team are truly specialists in the field and this shows in the way every project is handled, as highlighted by our latest review from Mr Standley in Ipswich following his Tortola model Patio Awning installation. As part of the garden scheme at their newly built property in in Lytham St. Annes, Lancashire, the Hudsons, who love to cook and entertain outdoors, incorporated two Deluxe Outdoor Living Pods into their scheme to provide them with the flexible shade and shelter they needed. 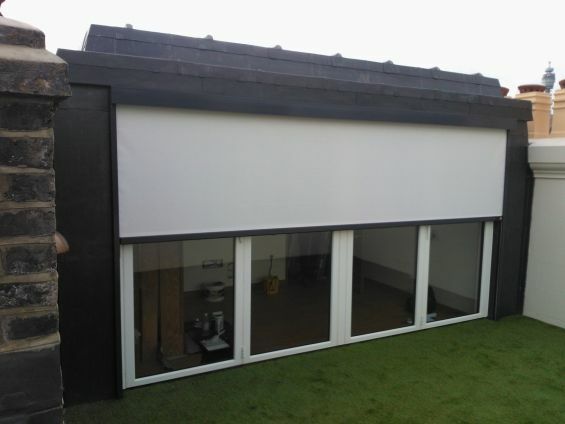 When investing in external shading, you want to make sure that not only the product is of the highest quality so it can withstand the changing British weather and that it performs the function expected, but also that the service provided is of the highest quality and the end result is exactly as you envisaged. 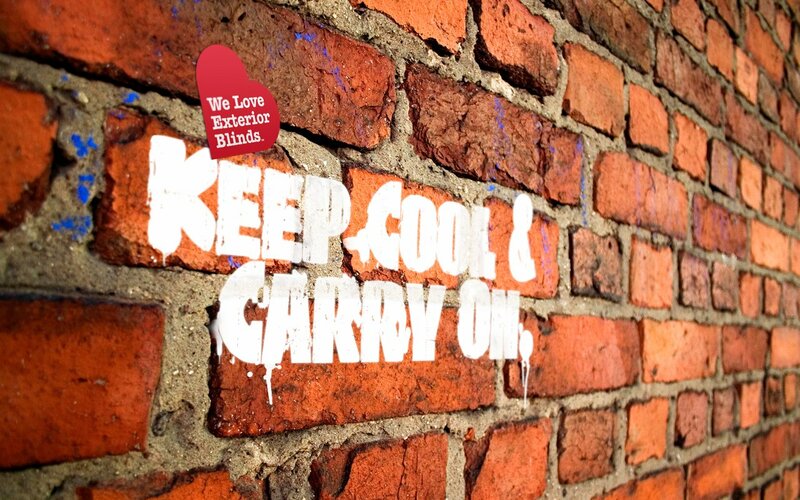 You’ll barely know our team are there until your blinds are installed. 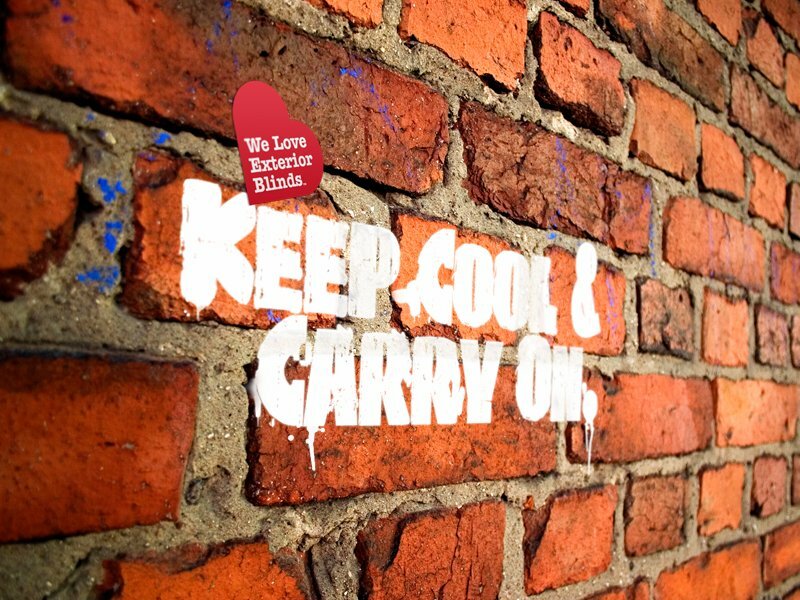 It’s always a stressful time when you have external tradesmen at your property, worrying about the mess that could be created, any damage they may cause and whether they will get the work done to your satisfaction and expectations. 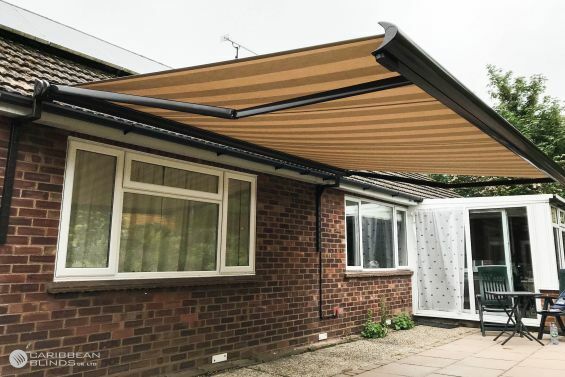 Having enjoyed the benefits of owning a patio awning for many years, the Salmons in Sutton Coldfield, Birmingham, decided it was time to upgrade for an upgrade. 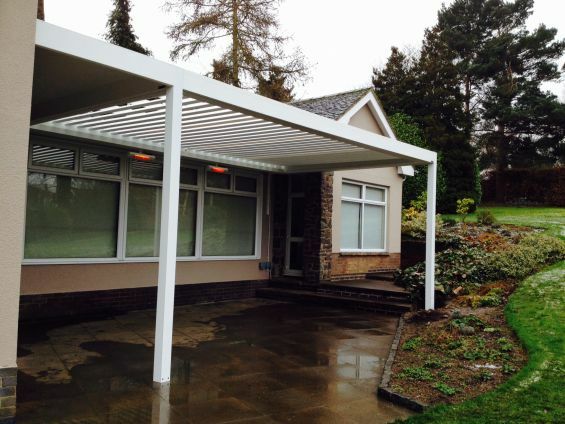 They wanted a flexible solution like an awning but something that could withstand all weathers, as they enjoyed socialising and throwing BBQ parties and didn’t want wind & rain to keep on bringing these to a halt. Mr and Mrs Young after having moved into a new build property in Milton Keynes, soon found their tranquil garden was bathed in the sun for most the day – part of the reason they were attracted to it. With a love of the outdoors, they found the space was uncomfortable to use, too hot and too bright, with the adjoining living room also becoming unbearable to sit in. The end of another week and another great customer review received, praising the quality of the whole process and product itself. 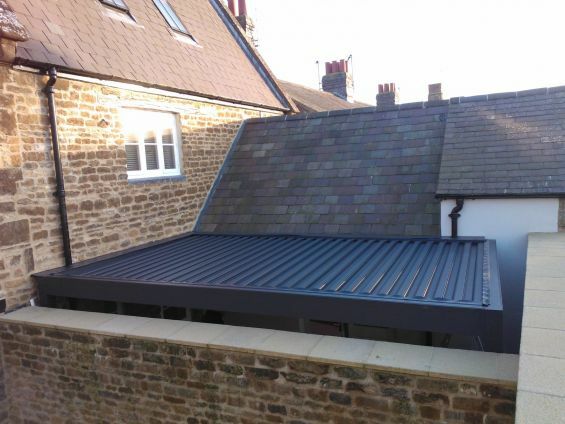 We’re often asked what the difference of dealing with a company dedicated to external shading is, given we’re the only company in the UK who is and this review from Mrs Horner near Witney, Oxford following the installation of an external roof blind to her pergola sums it up perfectly. 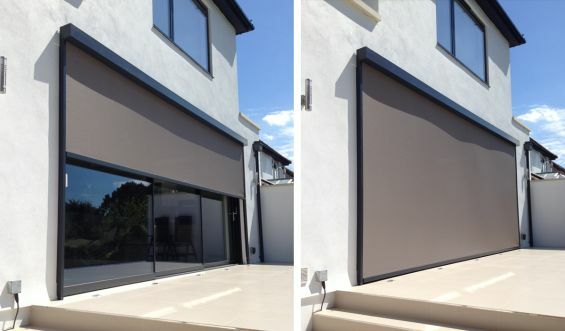 For three decades we’ve worked to ensure that not only do we provide superior quality external shading systems but that our team provide a first class service, which is one of the reasons we do not use agency staff or sub contract out any of our work and why our team undertake ongoing training in relation to their specific roles. In fact this week, many of our team members have been in for refresher training ahead of the busy Summer months to come. 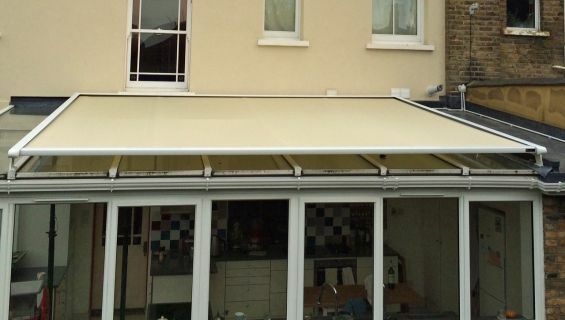 Mr & Mrs Reddy having recently moved into a seafront property in Southsea were after an awning to maximize their enjoyment from the outdoor space, however, it needed to be extremely robust due to their coastal location (see image below). 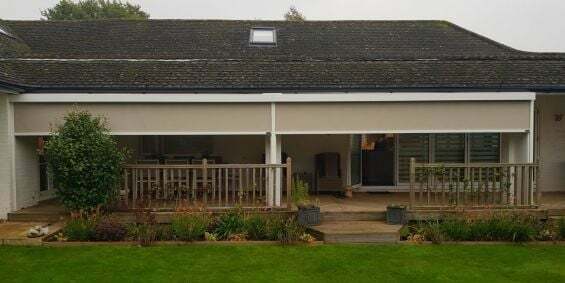 Following a recommendation from a friend who already benefited from a premium Caribbean brand awning which they had installed over a decade ago and was still functioning like new, they contacted us to discuss the options. The end of another week and another great review, this time following the installation of our blackout St. Lucia tensioned roof blinds to two opening bedroom skylights. The blinds were the final element to a complete renovation of a former retail unit into a luxury home nestled in Chelsea. 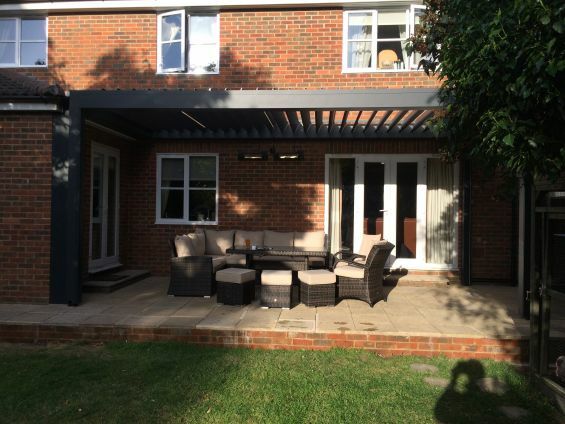 Our products are the very finest available, however, it is personnel who ensure complete customer satisfaction as this latest customer review demonstrates from Mr & Mrs Howell in Tattenhoe, Milton Keynes, following the installation of our innovative Outdoor Living Pod to their terrace. 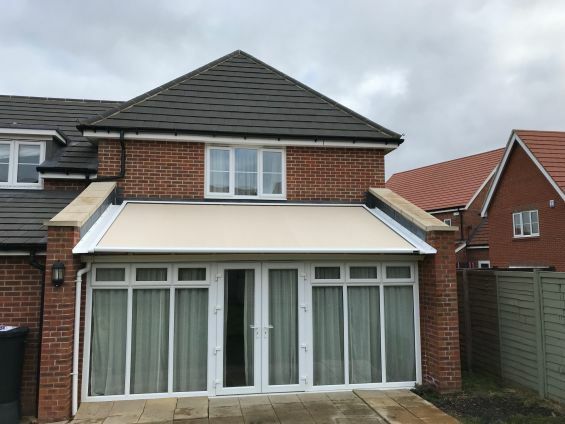 With building work fast completing on their home renovation and extension and realizing their new glass room living space was overheating before they had even moved in, the Malleys from Cambridge, knew they needed to find a suitable shading solution sooner rather than later. 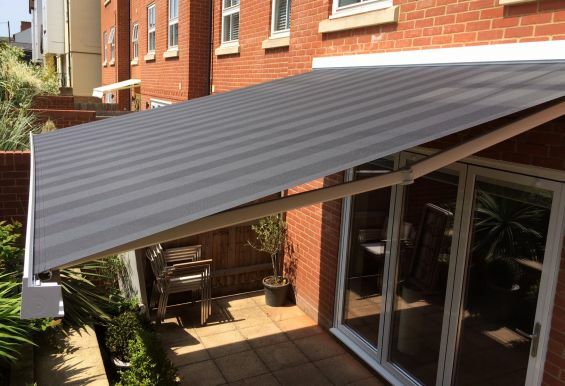 Awnings you couldn't live without! 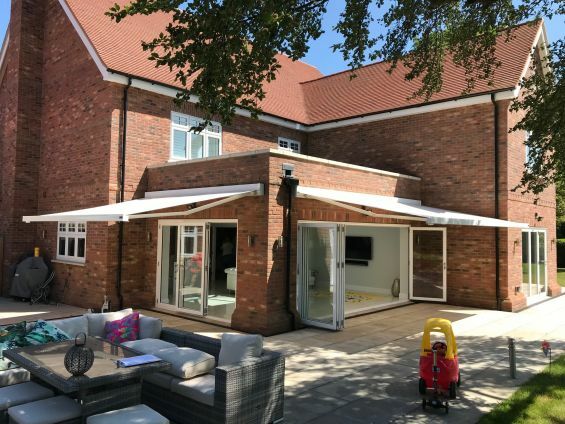 Having enjoyed the benefits of a patio awning for many years but now time for an upgrade, the Woodlands in Billericay took to the internet to research what ‘current’ options were available to them. 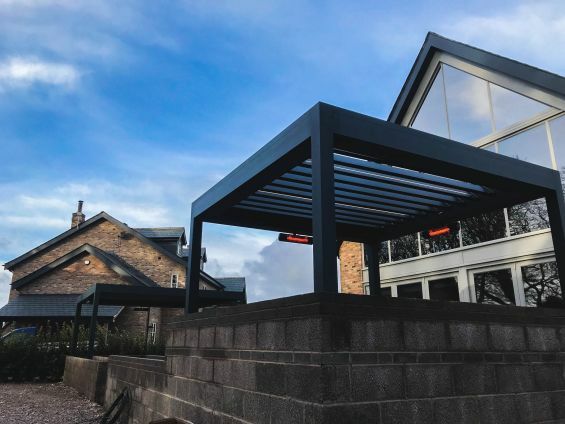 As they loved spending time in their garden, they were looking for a more year-round solution, particularly with sides to help protect from low sun and stop driving wind/rain, which was when they came across our all weather louvered roof pergola canopy and made contact. 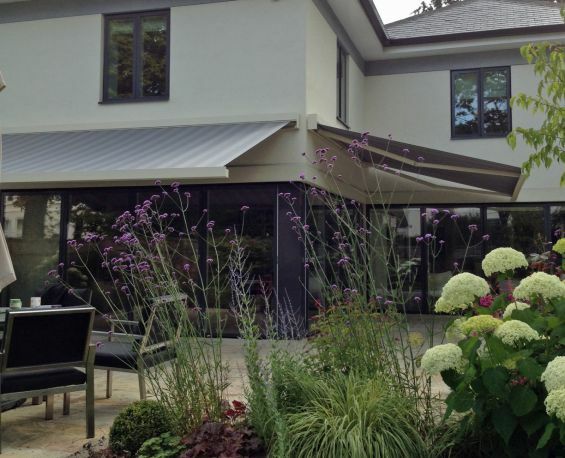 There are many benefits to manufacturing in the UK, aside from the pride of producing our own products, it means we can ensure we produce the highest quality external blinds and awnings that are crafted to the very pinnacle of precision and suited perfectly to the UK climate, able to withstand our ever changing weather conditions. 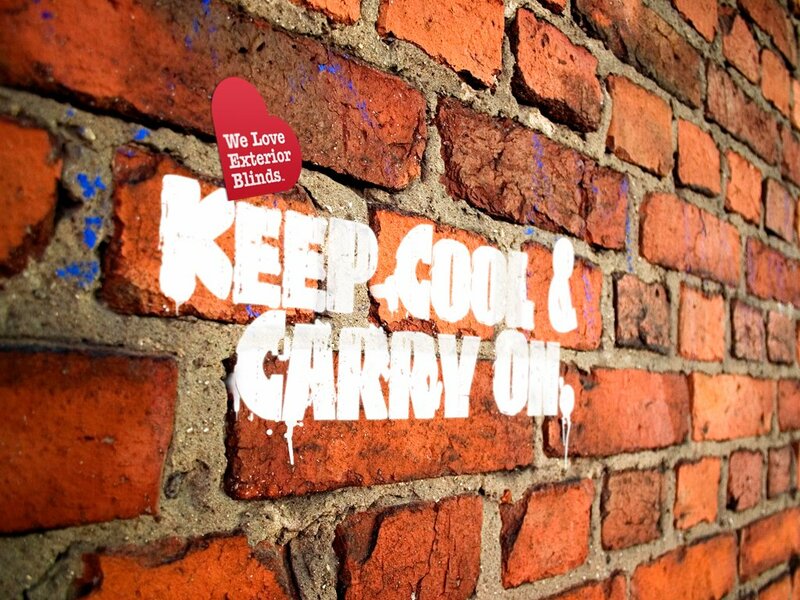 Unlike the industry norm which is to employ sub-contract fitters, at Caribbean we take great pride in the fact that all our personnel including our installers are employed for and work directly for us, having undergone lengthy training and equipped with the right tools for the job. 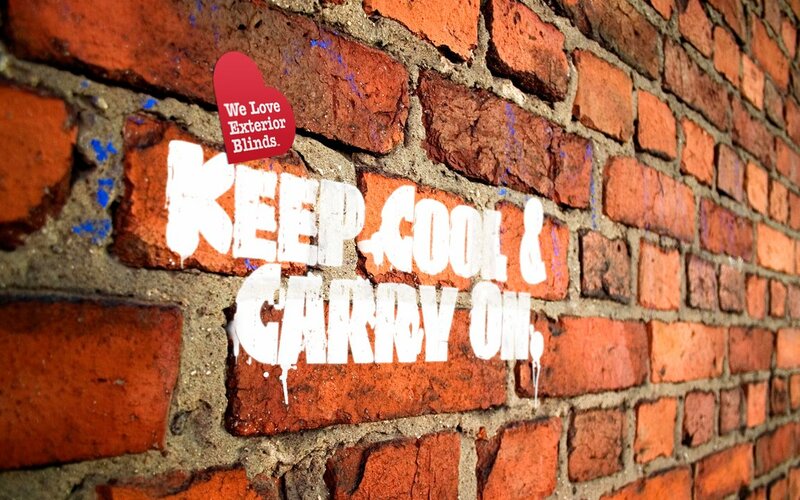 Don’t bake in your conservatory this Summer! 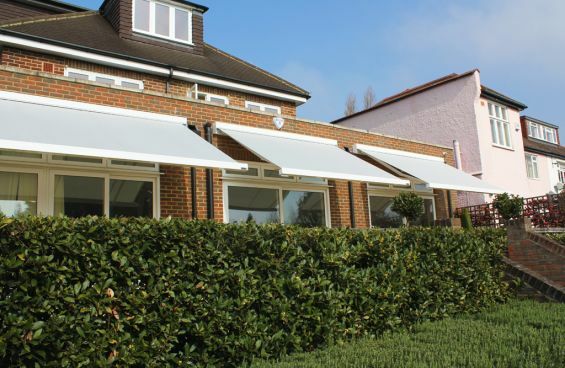 Stylish awnings for all applications! In built-up environments outdoor space is limited and this typically occurs with courtyard-style terraces. Furthermore, these type of terraces tend to be the worse sun traps as there is nowhere to escape from the heat besides indoors, which of course is the last place you want to be on a lovely hot Summer's day! 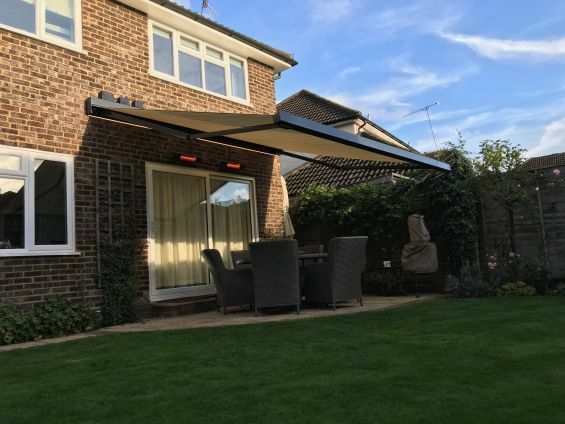 Having previously experienced the benefits of owning a patio awning, Mr Cato, on moving to his new home in Horsham, decided a patio awning was one of his top priorities so he could continue to enjoy the alfresco lifestyle he loved, especially with the warm weather approaching. Like a growing number of people, the Reeves opted for an all glass lean to pitch roof on the extension to their family home in Guildford, Surrey, complemented with bi-fold doors that opened up onto the terrace. 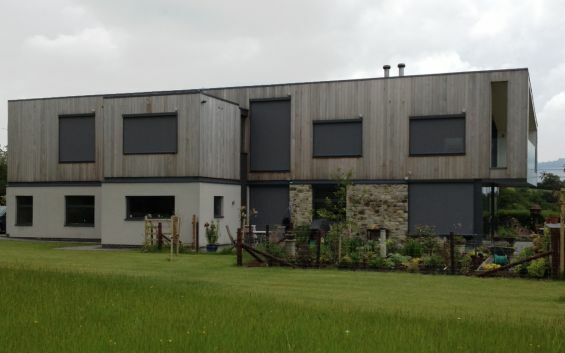 The extension, which housed in an open plan arrangement, the kitchen, dining and day lounge was meant to be the heart of the home, where the family could enjoy quality time together, however, even though the glazing was impregnated with a solar control coating designed to prevent overheating, the Reeves soon found out their new extension was a sun trap, heating up to uncomfortable temperatures, making the space unusable. The Oliphants in Brentwood, Essex, last year moved into a new build house which benefited from a large glazed roof to the open plan kitchen / diner complimented with bi-fold doors that lead out onto the terrace, allowing an abundance of natural light to flood into the heart of the home. 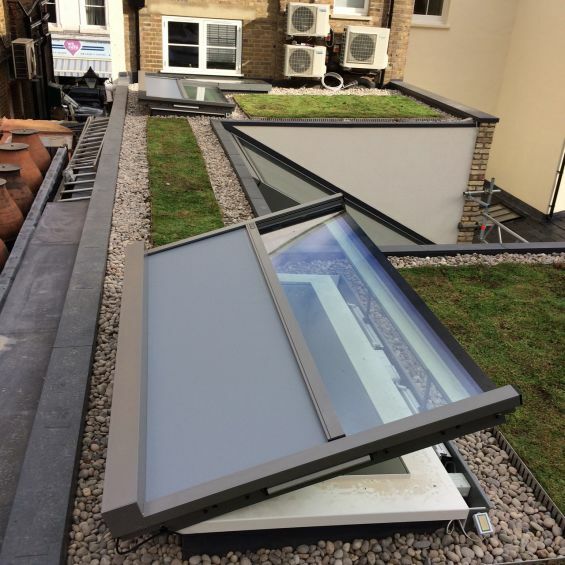 However, despite being fitted with a solar control coating to the roof glazing, which they were advised would ensure this space didn’t overheat, it did – find out why in our recent article ‘Magic Glass’. 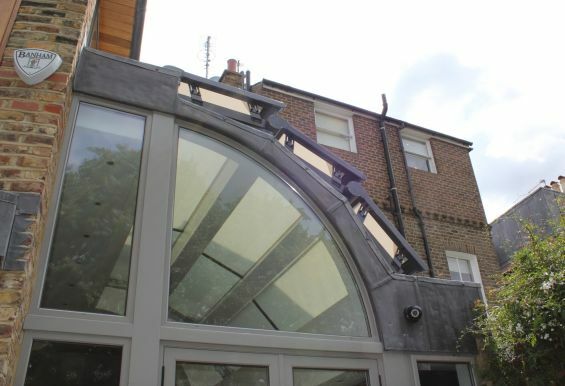 Recommended by their interior designer, for the quality of product and service we provide, our surveyor met with the Rooneys at their home in Fulham, London, during its refurbishment to discuss the shading requirements to the 3 skylights over the bedrooms and 2 further skylights over the kitchen. Looking to replace an existing conservatory to achieve an area in the garden that they could enjoy whatever the weather, without a solid structure and whilst still maintaining the ‘size’ of the garden, the Hickmans in Staines took to Google to see what was on the market that met their brief. 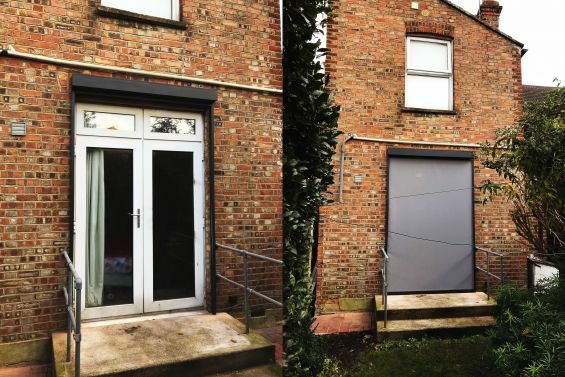 We recently installed a Cayman tensioned external roof blind to a conservatory in Guilsborough, Northamptonshire, at its maximum 18 square metre surface area in a single blind system. Following this installation, we received this 8 point review from the client discussing their experience with us, from initial enquiry to installation. One of the best ways to judge a company, is said to be by the way they deal with a problem (aftercare) and as the below comment demonstrates, following a recent service request from a client who had our Outdoor Living Pod installed at their property in Pinner earlier in the year, our post sale service is just as impressive as our pre-sale service. Mr & Mrs Whitbread, from Whitstable, Kent love outdoor living as they benefit from an exposed south facing garden. 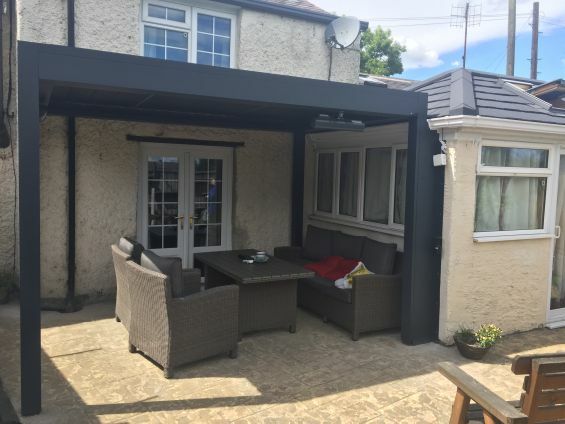 They previously had (as the before picture below shows), a patio awning installed (some 12 years ago) which allowed them more use of their garden, however, they were seeking all weather use of their terrace. 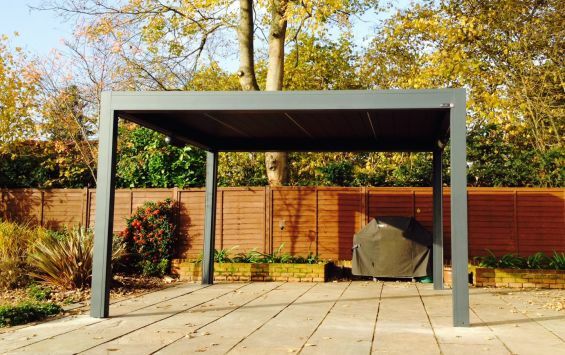 After seeing the Outdoor Living Pod in action at Grand Designs and the flexibility it offered, without spoiling the alfresco envrionment they both enjoyed, they decided it was time to invest. As this review shows, they are delighted with the finished result and how it has extended their enjoyment of The Great Outdoors. With more and more people turning to online reviews in order to make a judgement about how to spend their money, it's recently come to our attention that some companies are paying for 'fake reviews' in order to attract potential customers. Whilst reviews can give a good indication of a company's services and products, please consider that not every review online gives an accurate representation of the firm. We received the below feedback from a client in Haywards Heath following the installation of our Cayman external roof blind to their conservatory last week. “The installation was completed today, and both Jane and I are extremely pleased with its appearance, and from what we can see so far, the quality of the construction. More great feedback about both the quality of our personnel and products following a tricky installation of our Outdoor Living Pod to a terrace in Loughborough last week. 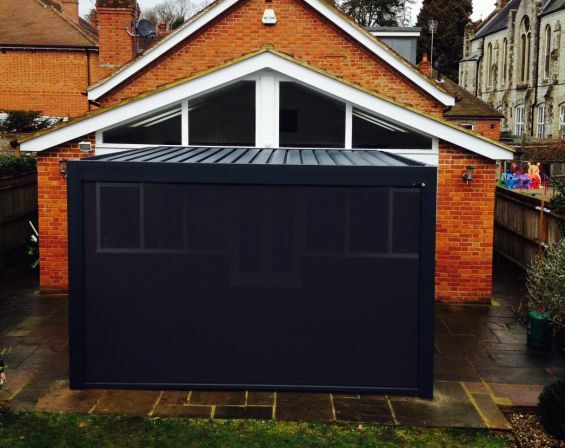 Another outstanding review following the installation of a freestanding module of our deluxe version Outdoor Living Pod, this time at a property located in an Area of Outstanding Natural Beauty (AONB) in Henley on Thames. The start of another week and more great feedback received from a client over the weekend who had an Outdoor Living Pod complete with all options; integrated screens, lighting & heating installed at their property in Bassingham last week. 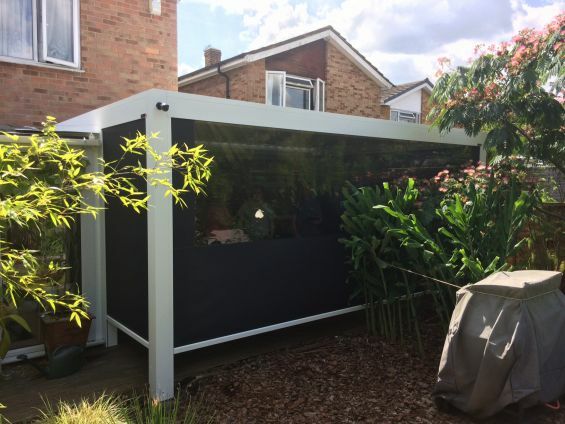 At the beginning of August we installed a large Outdoor Living Pod at a property in Romford, Essex complete with all options including lighting & heating plus screens to the sides to enable the client to use their terrace all year round. Once an installation of any of our products has been carried out, we don’t fit and forget, we write to confirm the installation is complete along with balance payment received, provide an additional electronic (pdf) copy of the Operation & Maintenance manual with product serial number and helpline details along with ask for constructive feedback on our service and product, which we duly post on here. We appreciate people are busy and don’t always have time to give us feedback, especially when everything has gone to plan, but its really nice when customers feel they need to let us know what we are doing is right and take the time to provide a full review of their experience of dealing with us, like the below, which a client from Portsmouth sent us at the weekend, post installation of an Outdoor Living Pod in their courtyard terrace. “We are delighted with the new awnings. The room is cooler and we are enjoying the outside shade and privacy the awnings give us. They look superb too and are very much in keeping with our contemporary house. 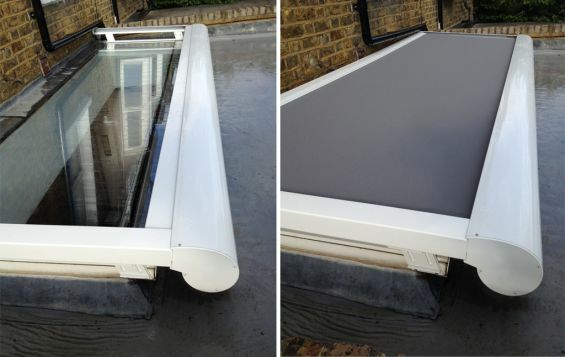 Last week we received a call from a customer where we installed in Autumn last year two tensioned exterior roof blinds (above) to the large skylights over their open plan living/dining/kitchen area at their property in Battersea. We today received the below review following the installation of our Outdoor Living Pod (OLP) at a new build bungalow in Ipswich, Suffolk. 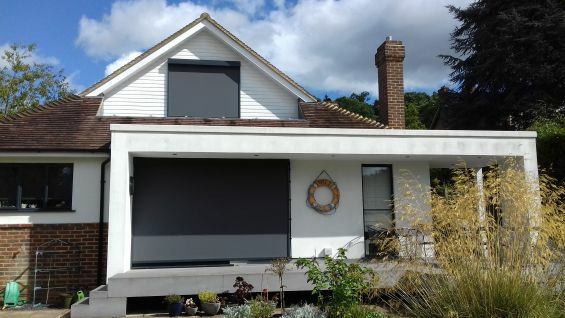 This particular Outdoor Living Pod hardware was custom finished in the same RAL colour (and gloss level) as the properties aluminium window frames to harmoniously integrate it and was fitted with bespoke infill panels (as above photo) to bridge the void between the rear posts and property façade, as due to the lack of eaves height above the doors/window where the OLP was going over, the structure had to be sited in front of the soffit/guttering. Our installation team have just completed what was probably the trickiest Outdoor Living Pod (OLP) installation of the year in Banbury, Oxford. This particular OLP was located in a courtyard, providing a roof to the entire area. Access was through the adjacent graveyard and over the side courtyard wall and the courtyard itself had a floor surface area of approx 15 sq/m making for a confined working space. Couple this with a property that had no fixing attachment to the rear due to the single storey extension pitched roof part of the property and a rough faced return side wall that was not at 90 degrees (circa 110 degrees) plus obstructions including downpipes and you have a challenge ahead, requiring skill, expertise and a range of fixing methods to overcome along with numerous bespoke infill panels to bridge the awkward gaps. We today received via email the below review about an Outdoor Living Pod (OLP) purchased at the recent Grand Designs Live (Birmingham) show and installed by our experts (or Pod Squad as they prefer to be called) on Monday & Tuesday this week in Nottingham. The OLP covers a large 7m x 4m area and fits between two buildings to provide complete coverage of this ultra modern, courtyard style terrace. Additionally the OLP aswell as being remote control operated, is linked into our new RS485 transmitter and operable from the clients home automation system. 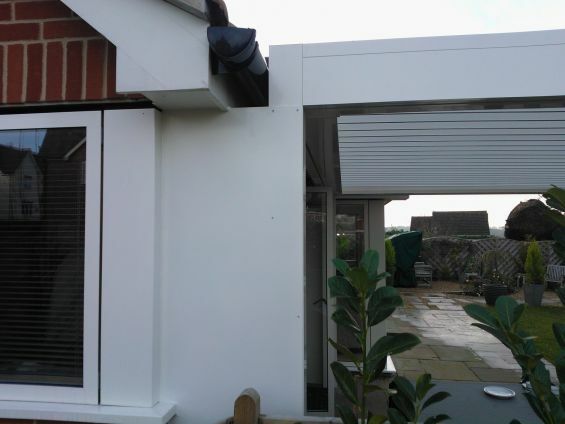 We recently received the below feedback from Mr & Mrs Graham of Loxwood following the installation of our innovative Outdoor Living Pod to the terrace area of their detached family home. 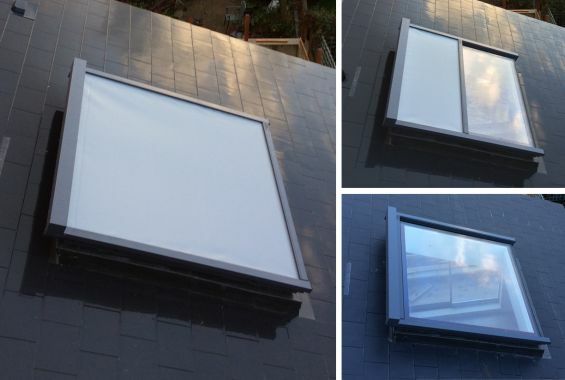 Following the heat wave we have experienced over the past few weeks, we received the below feedback from a client on the installation of our Cayman model tensioned external roof blinds to their architectural triple curved skylight above a kitchen/dining area in their modern family home in Putney, London.